Analog distortion with best wide range, from smooth distortion, crunch, to heavy distortion. Best for all genre of music like blues, rock, metal, and more. Clarity detail of string is very best , dinamic picking very responsive, and from fat to transparant sound. 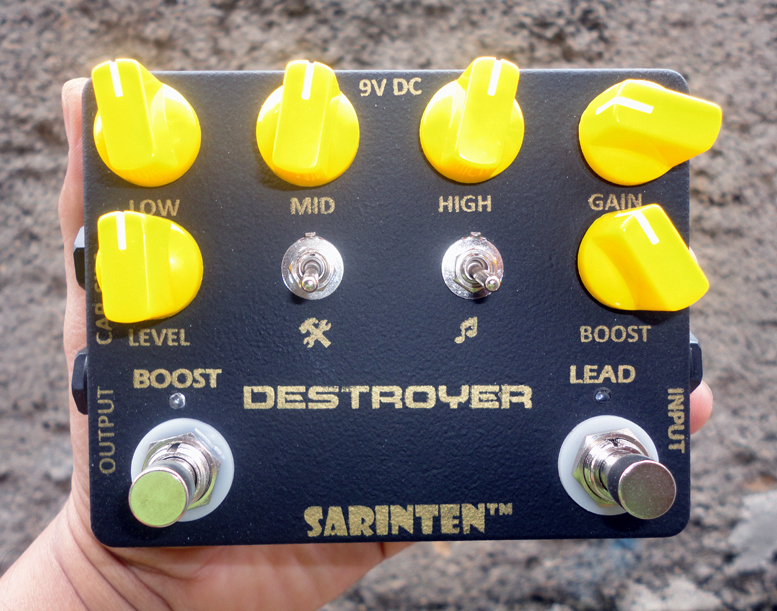 With this pedal you can play guitar tone of Van Hallen, Metallica, Guns’Roses, Sepultura, Red Hot Chillipapper, Vai, Satriani, Coldplay and many moore. Gain for best wide range. Low gain will give you clean, less turn up give overdrive, 9 clock will give you crunch, more will produce distortion to heavy punch. Toogle switch for basic distortion and degree of fat distortion. Every toogle have 3 choice mode. For basic distortion you can change tight to wet distortion. Fat mode have 3 choice from fat for heavy american gain and less for british gain. Cabinet simulator is independent. You can plug any amp, any distortion pedal to send return DRIVE BOX, and cabinet simulator will give you simulation tone. Plug to sound card and record that! You can plug cabinet simulator to mixer, without direct box. LEAD and BOOST is independent. You can play one channnel without other affected. You can off the LEAD and use BOOST, and the opposite. Or you can use LEAD AND BOOST together for lead section. When you plug other pedals before DESTROYER, you can use 1 switch left or right channel, or all switch function. This product can purchase here, contac us via whatsapp/call/sms at +628988839088, or you can invite my BBM at D3974188, or you can send email to me at amtech.78@gmail.com. Or everyone can meet me at my whorkshop at Jalan Sirsak 84 Ciganjur, Jakarta Selatan, DKI Jakarta, Indonesia. 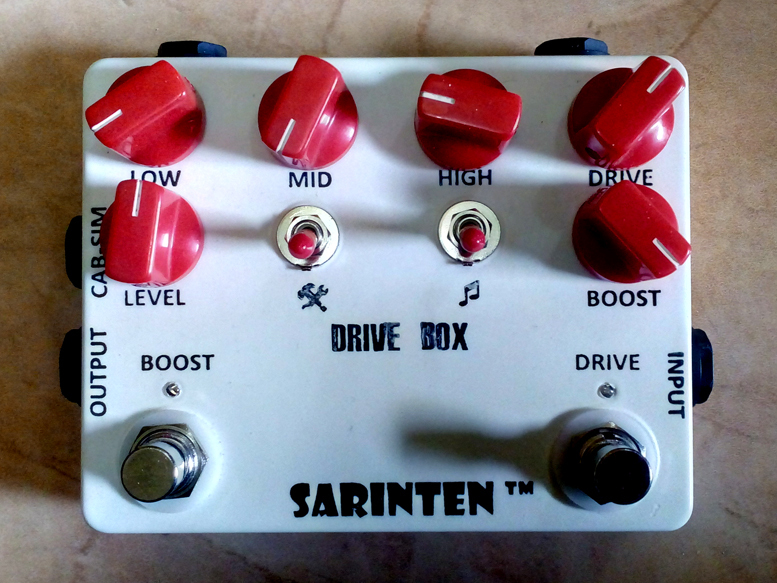 This is best analog overdrive that made from SARINTEN PEDAL by AMTECH-HANDWIRED, overdrive with best features that never found in others. We create drive box with many character overdrive from smooth to hard sound in different clipping, and we create booster for many function. Basic function overdrive and boost. You can send your guitar jack to input socket and plug your amplifier cable to output socket. Overdrive with many character, you can sett up in 2 toogle and gain, its from smooth to hard overdrive. You can choice your tone like TS, SD-1, Blues Breaker, Bad Monkey, and many moore. And the booster switch is the clean booster for lead without no character colouring. Boost for guitar amp. Need 4 cable for use this function. Guitar plug to input, send pedal to input amp, return pedal to send amp, and output pedal to return amp. This mode will give 2 function for 2 switch in drive box , drive switch is will give you booster for distortion amp, it’s wet booster, like tube screamer boost for distortion amp. Other switch, boost switch will give you booster to lead. 2 booster amp in 1 pedal. Boost for distortion pedals. Its same with number 2 that diferently is boosting for distortion pedal . Guitar plug to input pedal, send DRIVE BOX pedal to input distortion pedal, return DRIVE BOX pedal to output distortion pedal. Output DRIVE BOX to amp input. Like number 2, the right switch, drive switch will give you wet boost for distortion pedal, and left switch is for clean booster for lead. Cabinet simulator is independent. You can plug any amp, any distortion pedal to send return DRIVE BOX, and cabinet simulator will give you simulation tone. Plug to sound card and record that! You can plug cabinet simulator to mixer, and don’t need a direct box. Overdrive and booster is independent. You can play one channnel without other affected. When you plug other pedals before DRIVE BOX, you can use 1 switch left or right channel, or all switch function.